"Let's go down then, if we agree," said the old man, and followed close behind her. Going up to the fireplace, he pushed the big kettle aside and reached for a smaller one that was suspended on a chain. Then sitting down on a three-legged stool, he kindled a bright fire. 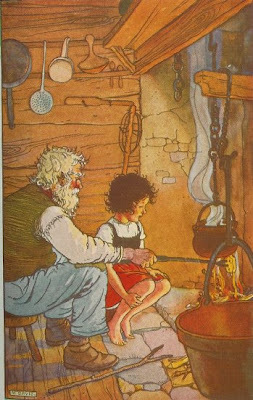 When the kettle was boiling, the old man put a large piece of cheese on a long iron fork, and held it over the fire, turning it to and fro, till it was golden-brown on all sides. It has been such a gray and dull day that we decided to cheer us up by having raclette for dinner. We can't get the right kind of cheese in our small town but I have found that it freezes well. Every time I go to town I buy some, slice and freeze it. Raclette is slowly getting known here. Switzerland is our family’s favorite vacation country so raclette has been on our family's top list for many years. I should have the recipe somewhere and will look for it later today or tomorrow.